Deciding between carpet or hardwood floors for your home? It’s a tough choice for many homeowners. As I’m contemplating buying a home, “carpet vs hardwood” is a decision I’m making now, too. This is one of the first questions that comes up when choosing between carpet or hardwood floors. The simple answer is that carpet is much cheaper to install per square foot than hardwood floors. There is a huge caveat to this comparison — long-term cost of maintenance and replacement. Sure, it might be cheaper in the short term to install carpet vs. hardwood floors — but it’ll likely cost you a lot less over the long run to install a hardwood floor! The average lifespan of a carpet is anywhere from 3 to 10 years. If you buy a cheap carpet that isn’t very well made, has poor-quality fibers, and sub-par backing — you can count on the carpet not lasting you as long as a carpet that’s well made, features better fabric, and has exceptional stitching. Carpet in high-traffic areas of the home is also likely to show it’s age much more quickly — while a hardwood floor can last indefinitely with the proper maintenance. How many times have you visited a house that’s 100, 200, 300, years old or even older and have seen the original hardwood floors? Betcha you’ve never seen a 100-year-old carpet! Nope, neither have I.
Yep… it’s been there since the Berlin Wall fell. After 27 years, that old carpet had seen better days. And a new carpet of that size can cost $500 to $1,000 to replace it, based on the texture and quality of the carpet. Deciding whether or not wood flooring or carpeting is the better choice in this department is all a matter of personal preference. Wood Floor — Wood floors are hard, the unique woodgrain will show in each plank, and wood floors are normally going to appear some shade of tan or brown — based on the type of wood and stain used. Carpeting — Carpets come in a rainbow of colors, and plush textures range from firm berber to soft shag. Additional padding under the carpet can also make it feel softer. You should also take into account the style of the room and purpose of the area in addition to personal preferences when deciding whether or not you want a carpet or hardwood floors. One benefit of installing a hardwood floor is if you want the look and feel of carpet, you could add an area rug to visually soften the appearance of the floor and add some color. While I think hardwood floors can look good just about anywhere, carpet also has its place. For example, a nice, plush, saxony carpet may look much better than a wood floor in a cozy den. Turning your basement into a “shagadelic” 1970s pad? Well, they don’t make shag wood floors… but a bright orange shag carpet would feel right at home there. Renovating a mid-century ranch house? Consider wall-to-wall carpet. It became big in the 1950s and 1960s, when it was becoming affordable to own it. By the end of the 1960s and into 1970s, wall-to-wall carpeting was in countless homes throughout the nation. Then again, there are some areas of a home where carpet was once common but may now be outmoded. Consider the once-popular fad of installing carpeting in bathrooms — and kitchens! (Oye veh — imagine all the mold and mildew that could take root in a bathroom carpet). And ever try carpeting in the kitchen? I grew up in a house that had a kitchen carpet. Golly, the stuff you find in a kitchen carpet — it’s more than just a lot of food crumbs, let me tell you! Meanwhile, there are places where a hardwood floor would be perhaps the only proper choice. For example, a Victorian home is the first setting that comes to mind where wall-to-wall carpeting would be a period aesthetic no-no. Environmentally safe wood floors are also the best choice for general decor in contemporary homes — which emphasize clean lines, easy maintenance, and abundant versatility. 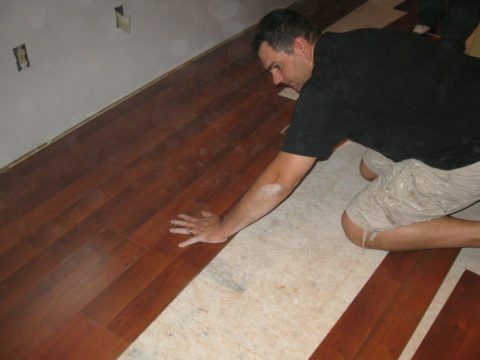 Are hardwood floors better for those with allergies? Is carpet hypoallergenic? I might sneeze up a storm under a rain of yellow pollen from a springtime oak tree, but aside from that I have few allergies. However, many people I know are allergic to a variety of things — including the stuff found in carpeted homes. As you probably know, carpet is really good at retaining a host of allergens, not to mention dust, pet dander, dirt, and — oh boy — pollen. I often wonder if my olfactory life will be any better when I live in a home with hardwood floors. You see, hardwood floors don’t hold nearly as much grime, dirt, and other junk that can exacerbate allergies. Carpet is really good at trapping schmutz in the nap. Hardwood floors, meanwhile, don’t retain dirt, grime, dander, and other nasties the way most carpets do and can be easily mopped or swept to keep them clean. So, does that mean carpet is a no-go if you or your housemates have allergies? Hypoallergenic carpets that are made from natural and synthetic materials. Synthetic hypoallergenic carpets are also available these days. If you’re choosing between wood floors and hypoallergenic carpets, the decision comes down to cost and upkeep, as well as general aesthetics. Do remember… hypoallergenic carpet will eventually start breaking down and need to be replaced in a few years because it won’t last forever. Carpets need to be vacuumed on a regular basis and steam cleaned every now and then. Wood floors need to be mopped and waxed regularly. As mentioned earlier, carpet needs to be replaced every 3 to 10 years, on average. 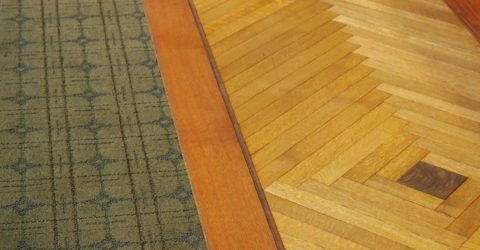 Wood floors don’t generally need to be replaced unless they’re damaged. But they might require a good sanding and refinishing every 10 to 20 years to keep them looking in tip-top shape. Solid wood flooring can withstand numerous refinishes — up to 10 or more, based on the thickness of the wood and type of refinish job. Laminate wood floors , meanwhile, are synthetic and don’t need refinishing. But they sometimes cost more and aren’t quite the same thing as having Real McCoy solid wood floors. So there are some considerations to take into account there. When all is said and done, you’re not going to get out of maintaining either a carpet or a wood floor. Both types of flooring have their advantages and disadvantages. The question comes down to what’s right for you? Hopefully, this post has helped answer a few questions and guides you toward making the right choice of carpet or hardwood floors for you, your budget, and your household needs.